In response to the threat of Eurozone recession, the ECB moved doubly: on March 7th it pledged that interest rates would stay at current levels at least through year-end and also announced, sooner than expected, the launch of new TLTROs (targeted longer-term refinancing operations) in September to assist cash-poor banks around Europe. Moreover, the ECB is said to be considering tiered deposit rates which would lower the charge paid by banks on parts of the excess cash placed with the central bank. The measure would be aimed at propping up bank profitability and resilience during an unforeseen slowdown. It would also potentially undermine the incentive underlying negative interest rates — to put money to work rather than depositing it with the central bank – and it would signal the likely persistence of near-zero interest rates for a lot longer. The ECB cut its Eurozone growth forecast for the current year from 1.7% to 1.1%. The German Purchasing Managers Index, a measure of activity in the German manufacturing and services sectors, came out at 51.5, the lowest reading since 2012. In contrast, the IFO index of German business sentiment surprisingly climbed to 99.6 from 98.7 month-on-month in March against consensus expectations of 98.5, pointing towards a German economy which may yet be more resilient than expected. Yields on the 10y Bund have dropped below 0% on March 22 for the first time in three years..
Rates in Germany remained at the lower side of 30 bps in January. Compared to last year this represents an increase of 9 bps. The biggest winner for euro denominated deposits is Malta with a 8 bps increase compared to December 2018, though this still puts them 5 bps below last years level. While Belgium enjoys a rate increase, Luxembourg and the Netherlands suffer an 11 and 13 bps decrease respectively. With regards to foreign deposits, Romania is the biggest loser with a drop of 12 bps followed by Croatia with a 7 bps decrease. In January one cannot observe a Brexit risk premium with rates only slightly increasing by 1 bps. 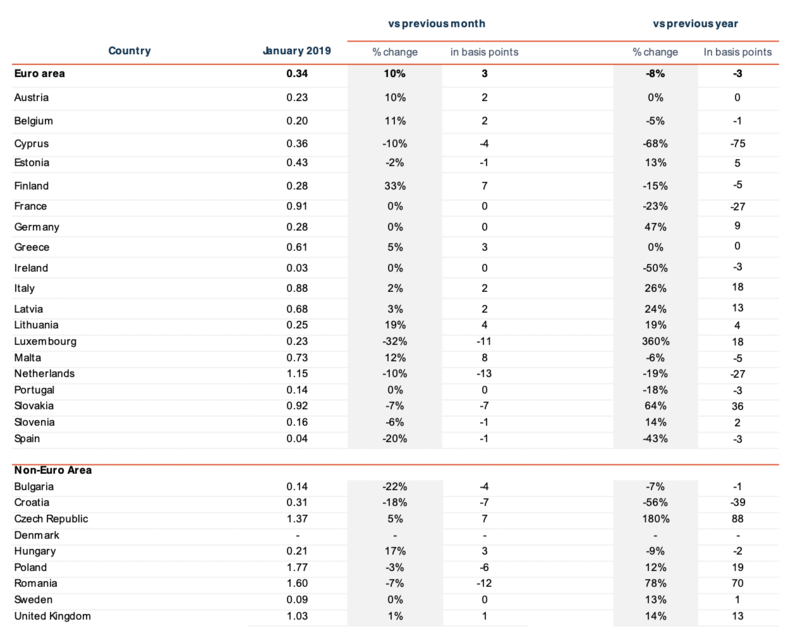 The clear winner is the Czech Republic with an increase of 7 bps compared to December 2018, which represents a noteworthy increase of 88 bps compared to last year. Average interest rate for new deposits, private households; maturities ≤ 1 year, ECB data. Note: The Dutch Central Bank time-series for deposits with maturities up to one year includes a country-specific “construction depot” with higher average rates than overnight and term deposits. Average interest rate for new deposits, private households, maturities ≤ 1 year, ECB data, in percent. Note: The Dutch Central Bank time-series for deposits with maturities up to one year includes a country-specific “construction depot” with higher average rates than overnight and term deposits. The Brexit impact cannot be observed from the current rates either. 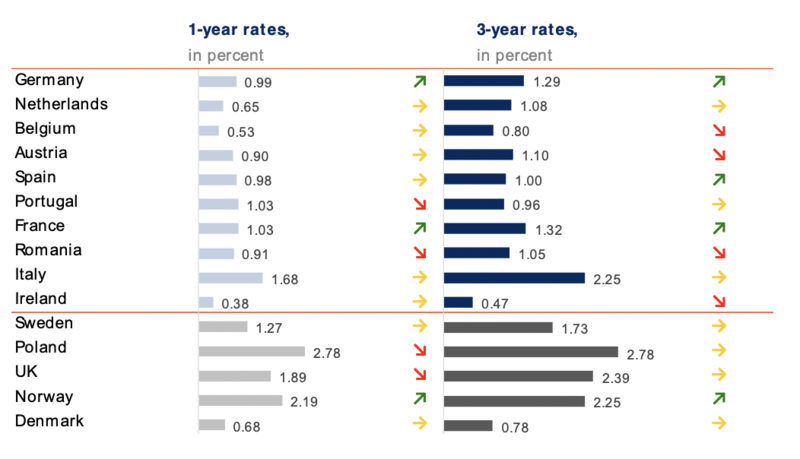 If anything the top rates for 1-year slightly decreased, while the 3-year rates remained at the same level. Interestingly however, Germany and France are the only euro countries that experienced a minor rate increase. Generally, rates are currently stable, rendering any trending movement in the euro area elusive. Most of the multiples changed very little compared to last month. For France and Germany the multiple increased, due to higher top offers. 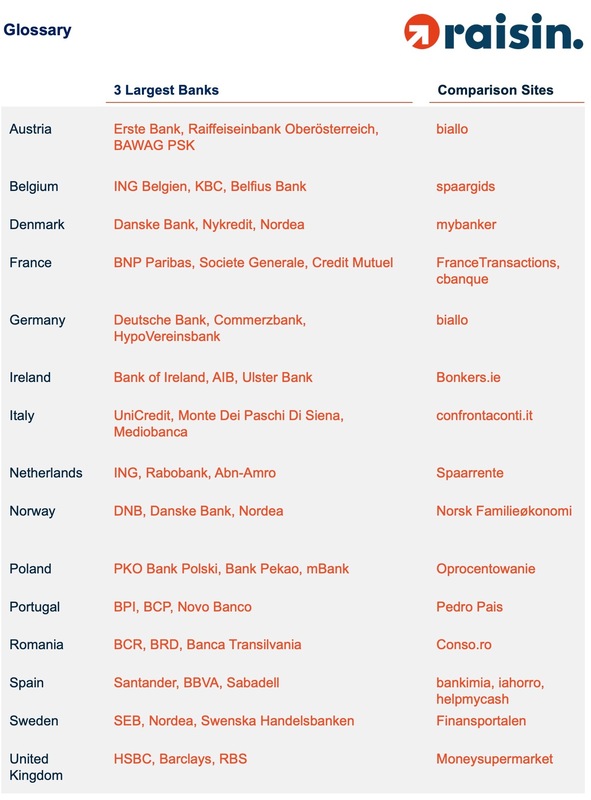 For the Netherlands this multiple increased as well, though as a result of decreased rates for the major banks. 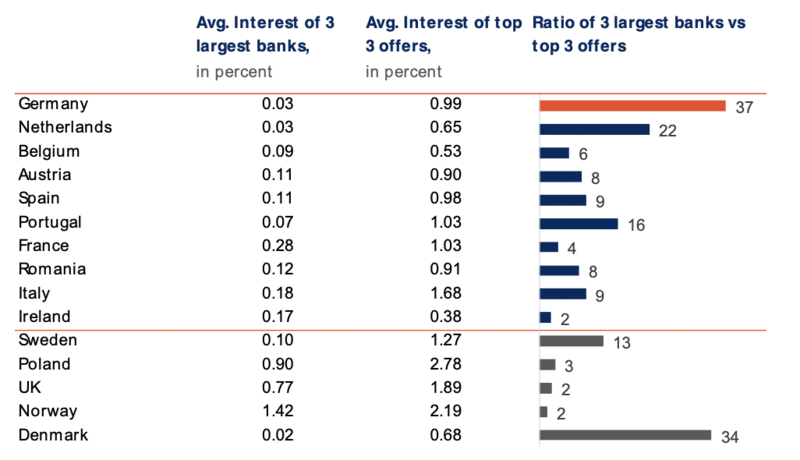 Meanwhile the interest rate gap — the difference between the average rate of a country’s three largest banks and the average of its top offers — continues to be the widest in Germany at 37 times higher for the average top three offers, with Portugal at 16 times higher. Average of the top 3 term deposit offers for retail customers based on local comparison sites as of 21/02/2019. Criteria: EUR 10,000 deposit; 1 product per bank; offers for both new and existing clients. Average of 1-year term deposit offers for retail customers offered by the 3 largest banks in the local market; as of 21/02/2019. Criteria: EUR 10,000 deposit; offers for both new and existing clients. Usually, largest banks based on balance sheet size, which offer term deposits. 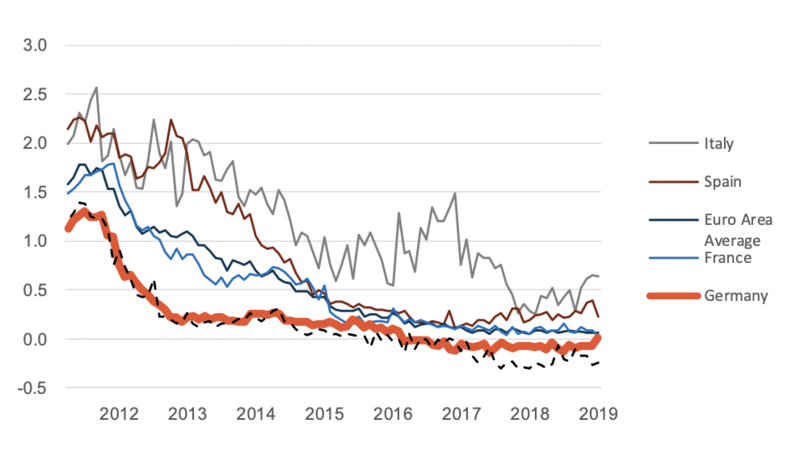 On average corporate deposit rates remained at the same level as December 2018. 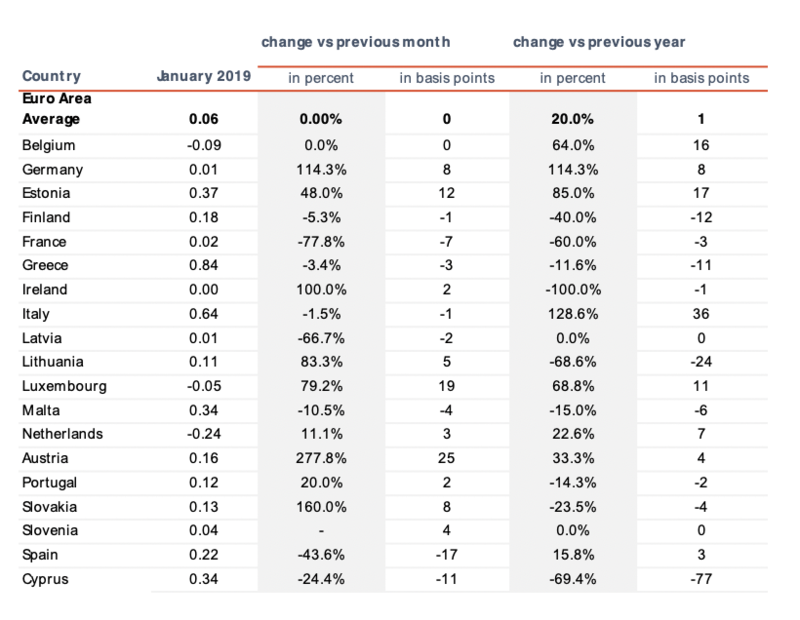 For Austria the rates increased by 25 bps (277.8%), which makes Austria the clear winner of January 2019. While the retail rates decreased for the Netherlands and Luxembourg the corporate rates increased, narrowing the gap between corporate and retail deposit rates. Average interest rate for new deposits, corporates, maturities ≤ 1 year, Euro Area Statistics, in percent. A trailblazer for open banking and the leading pan-European one-stop shop for online savings and investments, Berlin-based fintech Raisin was founded in 2012 by Dr. Tamaz Georgadze (CEO), Dr. Frank Freund (CFO) and Michael Stephan (COO). Raisin’s platforms — under the brand WeltSparen in the German-speaking world — are breaking down barriers to better savings for European consumers and SMEs: Raisin’s marketplace offers simple access at no charge to attractive and guaranteed deposit products from all over Europe, as well as globally diversified, cost-effective ETF portfolios (currently available in Germany). With one online registration, customers can choose from all available investments and subsequently manage their accounts. Since launch in 2013, Raisin has brokered 11 billion EUR for more than 165,000 customers in 31 European countries and 70 partner banks. Raisin was named to Europe’s top five fintechs by the renowned FinTech50 awards and is backed by prestigious European and American investors such as PayPal, Thrive Capital, Index Ventures and Ribbit Capital.